As a result of its imperial role, Britain was closely involved with such romantic and disruptive myths of power such as the imperial adventure hero and the self-deified charismatic leader. 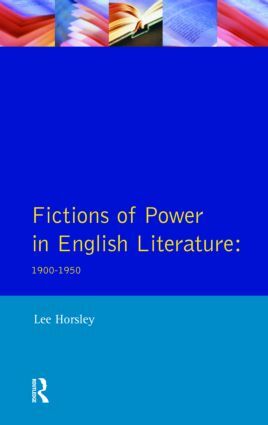 Lee Horsley explores fictional representations of political power during this period, surveying a wide range of texts from the adventure story, romance, thriller and science fiction to the novels of Conrad, Huxley, Orwell and Greene. 1 Heroic Action: Narratives of imperial adventure. 2 Superhuman arts: Narratives of nationalistic faith. 3 Sexual dominance: Leaders and lovers in fiction between the Wars. 4 Violence: The thirties thriller and the 'gathering storm'.